This year I started asking students to complete a simple assignment at the end of every unit that has come to be known as “Careers in Chemistry”. The purpose of the assignment is to expose students to career options that use Chemistry that they may not know much about. Students have come to the point where they know it is coming and expect it as we approach the end of a unit. I think quite a few students actually appreciate the assignment as it is not very difficult or time consuming to complete (i.e. easy points), and at the same time expands their view of paths they could follow that involve Chemistry. It also helps some students realize that Chemistry class is not just a place where we talk about and imagine stuff we can’t see, but the things we learn in Chemistry are actually used in real life in lots of different ways. The assignment instructions/guidelines I have been giving to my students this year for the assignment are shown in Figure 1. Careers we have done this year include: Medical Technologist, Forensic Scientist, Patent Attorney, and Chemical Engineer. Just recently a couple students in one of my classes jokingly suggested our next one should be “Chemistry Teacher” :). The assignment provides good bang for the buck as it is simple, easy to implement, and helps provide an answer to “Why Chemistry class?”. I love this idea and I will definitely be trying it for the reasons you mention. I am wondering if you assign a career each unit -- it sounds like you do. Also, do you help students find meaningful resources, instead of just typing in Google and taking what comes up first. I think this is a great idea not only to make chemistry relevant, but could be a great topic for a short circle discussion as well. Thanks!!! Hi Suzanne! Thanks for the comment. 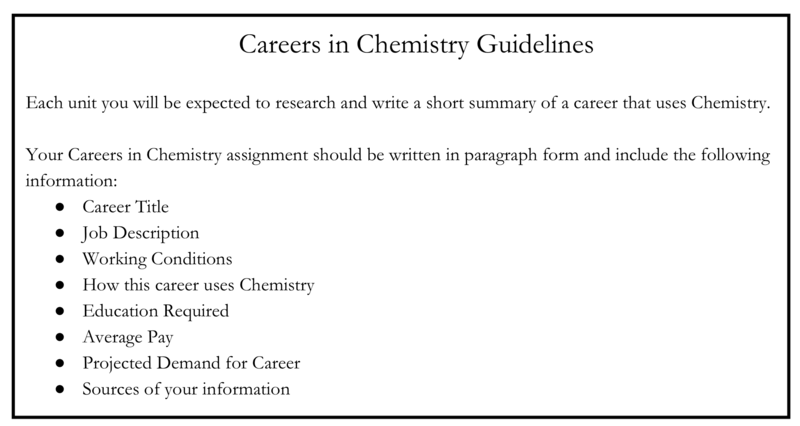 I have been assigning the career each unit, but you could definitely let students choose a career related to Chemistry. I expect students to use information from reputable websites (we do talk about what a reputable website is at the beginning of the year and I show them some examples) and ask them to cite which websites they use in their assignment.